Traditional character: Despite the ever increasing popularity of cheap Puerto de la Cruz holidays, the town has still managed to hang on to its Canarian roots. The beautiful town centre is weaved with narrow streets and quaint cream-coloured houses with intricately-designed wooden balconies. 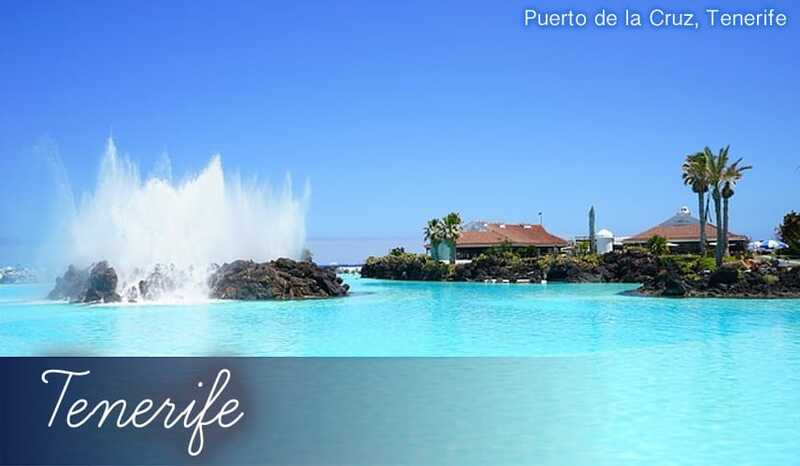 Active holidays: Aside from the fantastic black beach, there is a lot more to fill up your time during all inclusive Puerto de la Cruz holidays 2019. There’s the huge swimming complex of Lago Martianez, which has over 7 pools, plus you can visit the beautiful botanical gardens of Parque Toro nearby. In fact, there are several lush, flower-filled gardens close to where you'll stay during Puerto de la Cruz holidays. Stylish dining and drinking: Just as Puerto de la Cruz holidays have retained their Canarian character, it follows that the cuisine and culture of the area have stayed true to Tenerife too. That means you can expect lots of traditional Spanish restaurants in the centre, as well as classy cocktail bars where the locals and holidaymakers party together. Loro Parque: This huge zoo houses many exotic animals, a diverse array of parrots being the main draw. Loro Parque also has a particularly interesting selection of sea life, including piranhas and sharks, providing lots of excitement for families on cheap Puerto de la Cruz holidays. After looking at the tigers, gorillas and alligators and more you may fancy a change of pace in the zoo’s garden which features many extremely rare orchids. Lago Martianez: An awe-inspiring swimming pool complex, that’ll amaze you in its size and originality. The seven salt-water pools have been cleverly designed to replicate natural lakes and coastlines with towering palm trees and waterfalls. The largest lake also has a huge island in its centre. Truly an unmissable attraction if you’re off on your holidays to Tenerife. Many Gardens: Although not particularly large, the Botanical Gardens on Puerto de la Cruz holidays have many unusual plants and trees. Some of the trees here are very old and as such have taken on all kinds of strange shapes and forms. The twisting, bending species of trees in here look like something out of the 2009 film Avatar! Certainly they’re an unusual sight to see on holidays to Puerto de la Cruz. Then there’s the Parque Toro, with winding paths through lush vegetation leading to several spectacular waterfalls. And that’s not forgetting the Centro de las Orquideas, which features some extremely rare and beautiful orchids that also attract some colourful, pretty butterflies! Playa Jardin: Landscaped by Lanzarote native Cesar Manrique, this impressive beach has a gentle curve and also features tropical gardens and volcanic rocks. It’s adored so much it’s often the focal point for beach holidays to Puerto de la Cruz. The impression left by the volcano is also clearly noticeable in the sand – it’s a dusky grey-black variety, but don’t let that put you off as it’s also very fine and soft. Playa El Muelle: Only 30 metres in length, this small black beach offers a much quieter place to spend your Puerto de la Cruz holidays than Playa Jardin. However, it’s also less impressive and attractive than Playa Jardin so you need only go here if you fancy a change of scenery. Playa San Telmo: A very small, rocky beach. Being right by hotels, shops and restaurants it’s certainly convenient, but Playa Jardin offers much more space for full days of sunbathing on cheap Puerto de la Cruz holidays. Mil Sabores: In the Ranilla ‘restaurant district’, this respectfully renovated Canarian-style house has been converted into a traditional Spanish restaurant that offers wonderfully inventive cuisine at great value prices, ensuring cheap holidays to Puerto de la Cruz stay cheap! Pork Filet in Herb Crust and Lamb with Olives and Green Beans are just some of the perfectly cooked dishes you can enjoy here. Cha’ Paula: Cha’ Paula is located in the historic old town centre of Puerto de la Cruz holidays, and it has a menu that matches the proud heritage of the area. Tapas dishes include Chorizo in Red Wine, Baby Squid and Grilled Sardines. El Limon: Rather unusually for a Spanish restaurant, the menu here offers only vegetarian food. A great place to visit if you fancy healthy snacks on Puerto de la Cruz holidays, there are veggie hot-dogs, burgers, and tofu baguettes. Plus, you can choose from a wide choice of smoothies made with fresh fruit. Stylish drinks: There are a good number of vibrant Canarian bars on Puerto de la Cruz holidays, so you really get an idea of the local lifestyle on your Puerto de la Cruz holidays. Elements is a tiny bar set on 3 floors with chill-out music and a great selection cocktails, then you’ve got Color Cafe decorated with bright Bohemian patterns and playing the soothing sounds of jazz. If you’re after somewhere that stays open a little later, Acuzar is your best bet. This Cuban bar used to be an 18th century Gentleman’s club, and plays Latin and Salsa music across four floors until the early hours. British bars: Of course, you can still spend your holidays in a place that’s much more like home. The Beehive is very popular with British tourists as it shows every sport imaginable on huge TV screens, and also livens up the atmosphere by selling spirits and mixers by the pint! There’s always an Irish-themed bar everywhere you go, and holidays to Playa de la Cruz are no exception. Molly Malone’s sells the Irish favourites Guinness and Jameson, plus there’s live singing every night by the friendly owner. Modern shopping centres: Tenerife is big on shopping centres, and holidays to Puerto de la Cruz are no exception to the rule. The Commercial Centré Martianez, also known as ‘Piramides Martianez’ has over 60 shops with many being independent boutiques selling original items such as organic teas, health foods and one-off fashion designs. Centro Commercial La Villa is nearby too, just a ten-minute drive towards the neighbouring town of Orotava. This huge mall has a cinema, a McDonalds and many renowned brands like Mango, Benetton and Zara. Original boutiques: Wander around the historic centre during your Puerto de la Cruz holidays and not only will you see lots of fabulous, family-owned restaurants, you’ll also come across independent shops selling unique one-off designs. The best street for fashion is Calle La Hoya, where there are over fifty stylish boutiques.